In an interview with Blavity, Moye said Prince once told her he looked forward to her success -- and she certainly achieved it. Growing up in Minnesota, rock-and-roll artist Malina Moye, had her first interaction with stardom when she met Prince. As a kid with braces and pigtails, she walked up to the legendary musician and told him his work made her feel as if she could succeed. 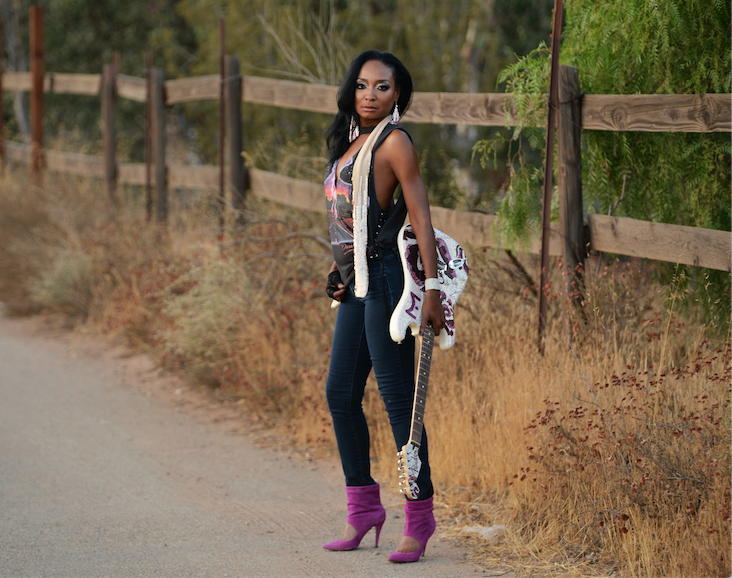 Moye, an international recording artist, has not only played for the Queen of England, she was the guitarist for Janelle Monae's new single "PYNK." "I remember him looking at me and saying, 'I look forward to watching,'" the 33-year-old said of the "Purple Rain" singer during an interview with Blavity last week. Her glimpse into fame was followed by a journey she never expected. Moye moved to Los Angles with $20 and a dream. "I was homeless on the street. I used to wash up at a gas station," she shared. As faith would have it, she was able to connect with people, and even raised enough money to launch her own record label, WCE Record. "When you're different, you have to think outside the box because a lot of people don't know what you're doing here," she said. "My goal is to find other artists who are different and to expose them because being first is one thing, but opening the door for other people creates the legacy." The Minnesota-bred singer comes from a musical family. When her father first gave her a guitar at just nine years old, he told her she was holding it the wrong way. But the left-handed artist said it was what made her feel comfortable -- the music career which would follow her early interaction with the instrument would be pursued in the same vein of authenticity. "I discovered what worked for me, and I'm going to keep doing it." Moye, who still resides in Los Angeles, is committed to breaking down barriers and establishing a path for black women to excel in rock-and-roll. She was the first Black woman to play the national anthem on a guitar at a major sporting event. "It's not about being the first, it's about making a way for everybody to get in," she said. "Everybody has a place and we all matter and we all count." Moye is in. And she's used the tribulations and heartache she's endured to continue creating captivating music, as evidenced by her latest album, "Bad As I Want To Be." "No matter what anybody says, I love myself, and I'm never going let anybody make me feel like I don't matter and I don't count," Moye said. "Bad As I Want To Be," made the top 10 Billboard charts in the blues category and earned the number one spot on the Amazon radio charts in Germany. Moye stressed that she wouldn't be successful today if it wasn't for the original queen of rock-and-roll- Sister Rosetta Tharpe. Tharpe's hit song, recorded in 1930 had a great influence over rock-and-roll legends such as Chuck Berry and Elvis Presley. "She is the black woman who started rock-and-roll, and people are leaving her out of the history books," Moye said. "Just now the Rock-and-Roll Hall of Fame is inducting her on April 14th." It's not only mainstream society who ignores black rock artists. Moye shined a light on companies like BET, whose award show does not include rock categories. "There are so many independent artists and [BET is] shutting out a lot of young African-American girls and diverse women who actually are playing guitar or want to experiment with different sounds because they're not specifically sticking to an urban format," she said. "It would be so incredible if your Essence's, Soul Train's and BET's, started to include artists of a rock genre," Moye continued. Despite the obstacles, Moye continues to rise. Her international tour kicks-off in June and she will be making stops throughout the U.S. and Europe. Her tour will extend beyond the stage. Moye uses her tour as an opportunity to engage with her audiences and inspire youth. Through her organization Drive Hope, she plans to host hope chats. During hope chats, she brings in different speakers to talk with the youth about passions and careers. "The goal is for people to realize I'm no different than you, and If I can do it, so can you." Moye doesn't plan on slowing down anytime soon. "I've always been here, but now people are listening," Moye said.